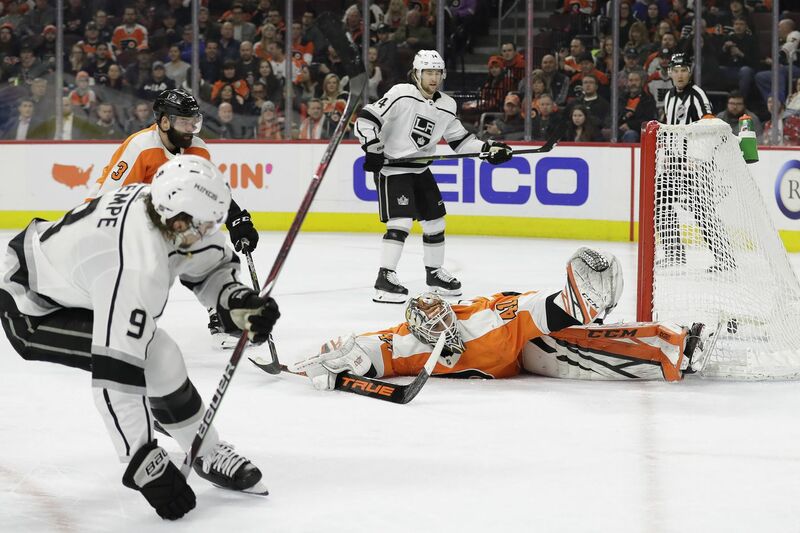 Los Angeles center Adrian Kempe (left) scores a second-period goal past Flyers goaltender Anthony Stolarz and defenseman Radko Gudas on Thursday. Well, they weren’t going to win every game, right? Despite getting 37 saves from Anthony Stolarz and despite getting a late goal in regulation from Jake Voracek, the Flyers’ eight-game winning streak came to an end Thursday as they dropped a 3-2 shootout decision to Los Angeles at the Wells Fargo Center. Tyler Toffoli won it in the sixth round of the shootout. After the third round, the Flyers charged onto the ice, thinking they had won after it appeared Adrian Kempe’s shot hit the crossbar. With their goalie pulled for an extra skater, Voracek tied it with 17.6 seconds left in regulation, taking a pass from Claude Giroux and firing a left-circle shot over Jonathan Quick’s right shoulder. Voracek punched the air triumphantly. With 57.8 seconds left in OT, the Flyers’ Travis Konecny whipped a shot off the crossbar on a two-on-one. Stolarz then made the save of the night, a diving stop on Kempe’s point-blank shot with 14.1 seconds to go in overtime. The Flyers, who also had their six-game home winning streak snapped, will continue their five-game homestand Saturday afternoon against visiting Anaheim. With the Flyers trailing 2-1, Voracek made a great move to get free in the slot, but his shot hit the left post with 18:48 left in regulation. About two minutes later, Toffoli also hit iron, this time while Los Angeles was killing a delay-of-game penalty. Badly outplayed for most of the first 27 minutes, the Flyers managed to tie the score at 1-1 when Couturier scored his 22nd goal of the season and seventh in his last 10 games. Taking a slick pass from a diving Giroux, an all-alone Couturier scored on a backhander from the slot, knotting the game at 1-all with 13 minutes left in the second period. A short time later, Radko Gudas sent a shot off the post – the closest the Flyers would come to taking the lead in regulation or the overtime. Nearly 5½ minutes after Couturier’s goal, Los Angeles regained the lead, at 2-1, as Kempe scored on a two-on-one after taking a feed from Brendan Leipsic. Stolarz, starting for the first time in nine nights, could not be faulted for either goal. In the first period, the Flyers didn’t have their legs, didn’t have much accuracy with their passes, had 11 giveaways, and allowed 18 shots. In other words, they were fortunate to face just a 1-0 deficit after the opening 20 minutes. Stolarz, coming off a 38-save performance in a 1-0 win over the Rangers on Jan. 29, made 17 first-period saves to keep the Flyers close. He has stopped 75 of 77 shots (.974 save percentage) in his last two appearances. In their history, only six Flyers teams had a longer winning streak than eight games, topped by a 13-gamer early in the 1985-86 season.